I wouldn’t call myself hoarder but there are definitely things in my house that I am not getting rid of anytime soon. Most of these are family heirlooms or items that I have had for so long that I just cannot imagine my life without them…no matter how dingy and old they get. So, I was recently doing some redecorating and came across a few old things that I haven’t used in years. I contemplated throwing them out or having a yard sale but I just couldn’t part with them. I began looking at possible ways to restore these old items and make them look new again, and I found ways to restore 25 different things in your home! I love a good restoration project and these are among the best out there. From restoring those antique mirrors and making them shine like new to removing cloudiness from your old glasses, there is a way to make just about anything in your home look brand new again. I got really excited about this one because now instead of worrying over whether I should just get rid of something, I can just try to restore it instead. These ideas are great if you’re planning a yard sale as well. 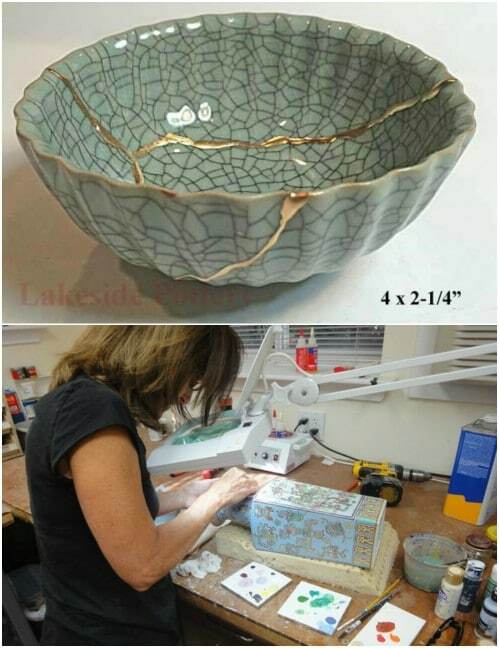 If you have older items that you want to bring more money, just spend a bit of time restoring them before you sell. That reminds me, there are ways to restore things outside your home, as well. Just take a look at this great way to restore your patchy lawn to a beautiful new state. Whether you want to sell your items and just want them in the best shape possible or you really want to keep them and maybe begin using them again, you’re sure to find a great way to bring back the beauty in everything from wooden or leather furniture to handbags, boots and even baby clothes. Oh, and if you’re planning to repurpose your baby clothes after those stains are removed, be sure to check out these 20 adorable baby clothes upcycling projects. 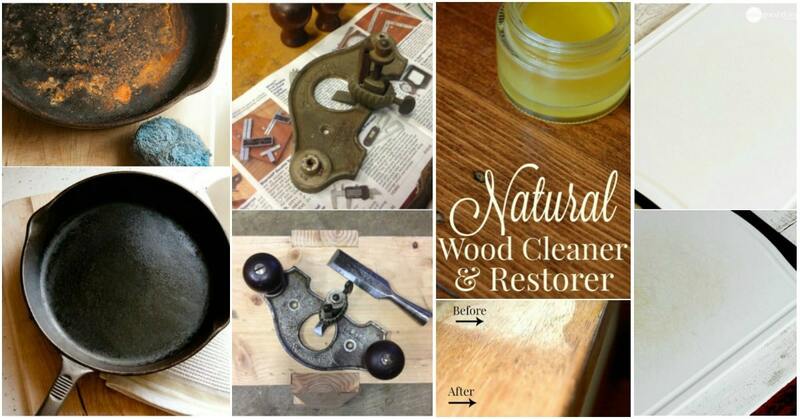 If you’re ready, we’ll take a look at some amazing ways to restore your old things and give them new life. I’m sure you’re going to find all of these projects helpful and I hope you will share your favorite restoration hack as well. I love my old mirrors but let’s face it, they get so dingy after a few years that you sometimes just want to toss them out and buy new ones. If you have really old or antique mirrors, this simply is not an option. 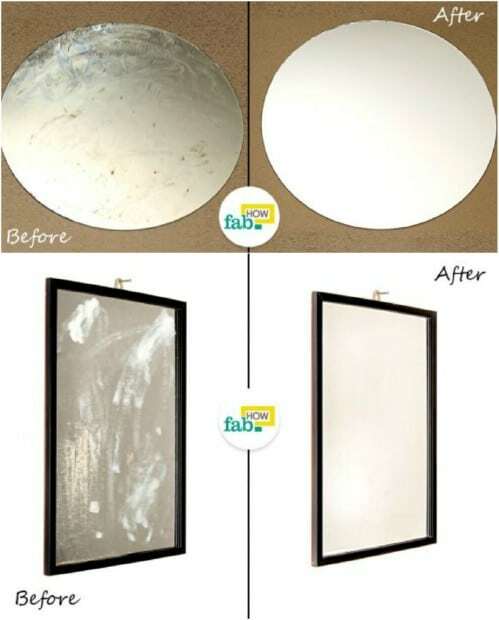 Instead of tossing that old mirror, you can restore it quickly and easily and give it back that like new look. You just mix up a vinegar solution to clean the cloud from your mirror and then tackle any wood or paint fixes that the frame may need. I’ll admit that there are some baby clothes from my kids that I just could never throw out. I want them to be able to use them for their own little ones in the future. If you’ve got some old baby clothes that are stained or yellowed, there is a quick fix for that and it leaves that clothing looking good as new. OxiClean works like a charm to remove those yellow stains and make that clothing wearable once again. Those old baking dishes do tend to turn black and rusty looking over time. Instead of buying new, you can simply remove the color from those silver trays and leave them looking – and baking – like new again. 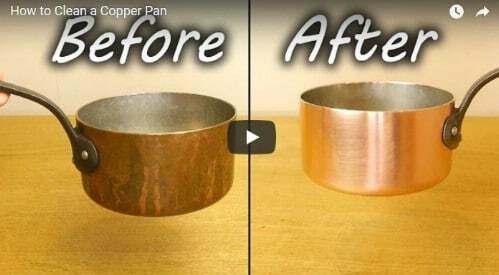 This little trick works with cookie sheets, pizza pans and cake pans. 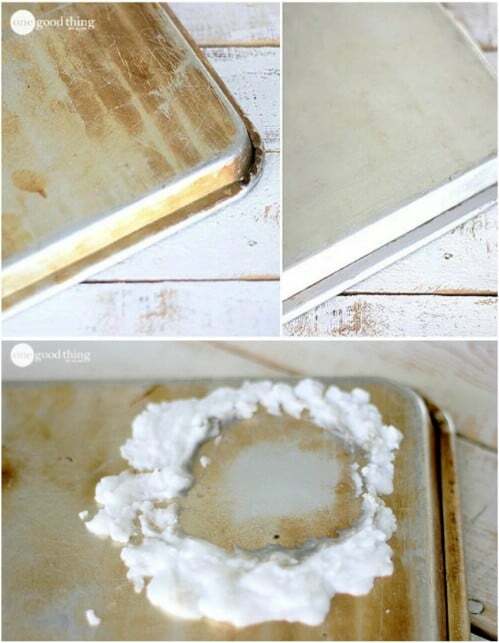 A mixture of baking soda and peroxide will scrub that greasy, dingy mess right off and leave those pans shining like new. Leather boots are not cheap, so when they get dingy or otherwise marred, replacing them is not always an option. 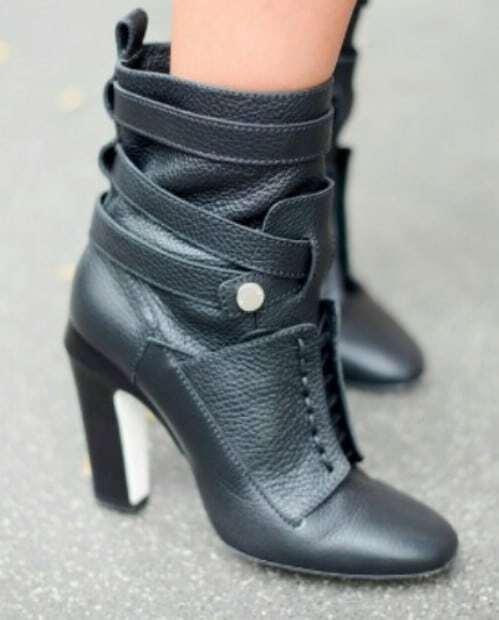 Instead of tossing those boots and shopping for new ones, you can easily restore your leather boots to their original shape by cleaning them with petroleum jelly. That’s right, that Vaseline in your bathroom cupboard will perfectly shine that leather and make it look brand new again. Old brass hardware is beautiful but unfortunately old sometimes also means dingy. If you have some old hardware hinges or door handles, you don’t have to replace them just because they have lost their gleam. Instead, try cleaning them by placing them in a slow cooker and adding dish soap. 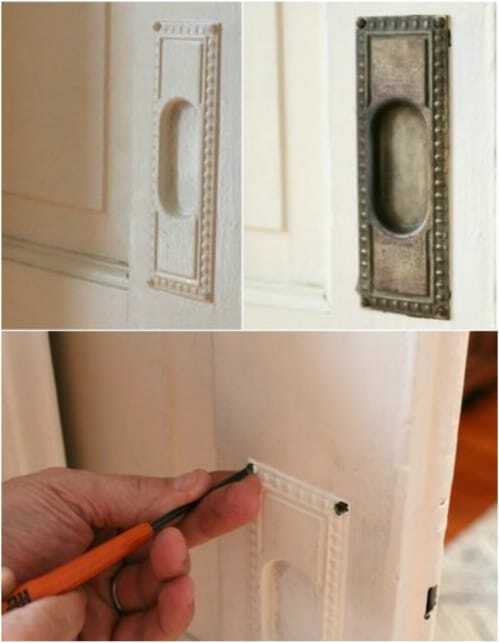 This works wonderfully to remove paint; just in case someone has tried to paint over them to make them look new. Turn your old carpets new again with a simple mixture of vinegar and water. Not only does the vinegar mixture remove stains from food, pets and other dirt, it helps to bring the carpet back up so that it’s not worn down as badly, which can make it look like it needs to be replaced. This little trick has saved my carpet on more than on occasion and can save yours, as well. I love cooking in cast iron skillets and no matter how careful I am about cleaning and drying them, sometimes they get a bit rusty. You don’t want to cook in a rusty pan, right? And throwing those skillets out is out of the question because they can be very expensive to replace. 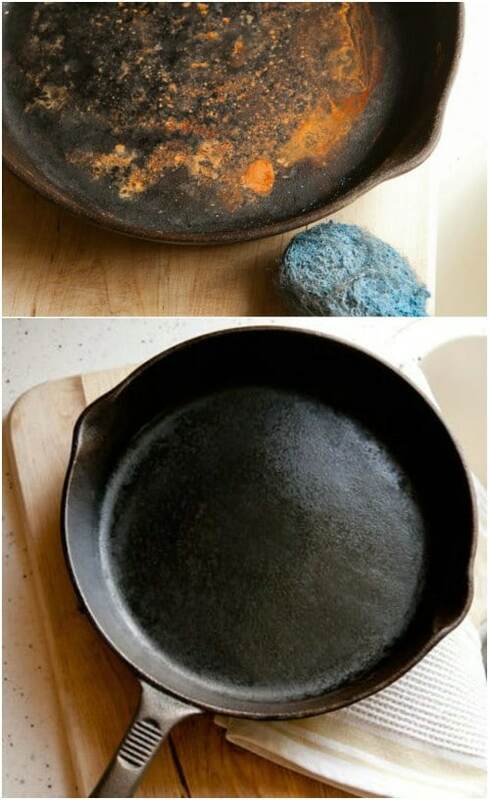 The next time your cast iron skillet gets rusty, try this trick of scrubbing the rust away with steel wool and then re-seasoning it with vegetable oil. FYI, I season my skillets with lard like my granny did in the day, but it’s your choice. If you use plastic cutting boards in the kitchen, you may notice that they can get stained really easily. Of course, you want those boards looking new so that there is no worry of germs and bacteria living on them, right? So, the next time your plastic chopping board starts looking a bit worse for wear, try scrubbing it with a solution of lemon essential oils and water. Then lay it in the sunshine for a few hours and let it dry. 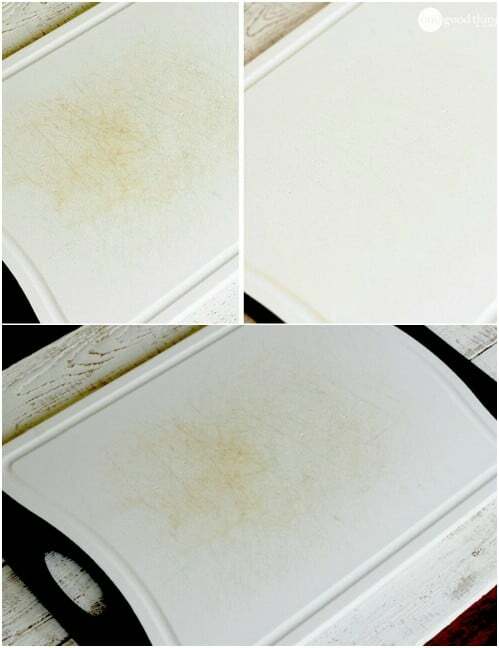 The stains will disappear and your cutting board will look new again! I have a set of old drinking glasses that are my favorites for when company comes over, but I’ve been noticing that they’ve become a bit foggy. No amount of scrubbing in the sink or dishwasher seems to help. This little trick of soaking the glasses in vinegar for five minutes and then rinsing them clean works like a charm. The vinegar removes the minerals that have built up on your glasses over time and makes them look brand spanking new again. Remember those adorable little toys that you had as a kid? The old TVs and radios that were plastic and so much fun? I found a few of those things from the 70’s at a yard sale a while back and while they were in pretty good shape, cleaning that old plastic is really difficult. This little hack of using Vaseline works perfectly to remove all those years of dirt and grime from those toys and other plastic items and make them look good enough to sell – for a small fortune! Okay, so you’re not likely to trash your car and buy another one just because the headlights are dingy but it does help you to see at night if you clean them. Instead of replacing those headlights, just clean them up. You can use anything from dish soap and baking soda to vinegar and even bug spray to remove the dirt and cloudiness from your headlights and make them perfectly clear once again. Leather couches are great and all but that leather can dull pretty quickly. Because those couches are so expensive, you’re not likely to replace them just because they look old, right? Right! So you just clean the couch with a damp rag and a few squirts of liquid hand soap, something gentle works best. This takes a bit of elbow grease but it leaves your couch looking new again and without you having to actually buy a new one. So, you have a favorite, and rather expensive, leather handbag that you really want to carry but it’s all stained and dingy. What do you do? Buy a new one? You don’t actually have to replace that handbag. 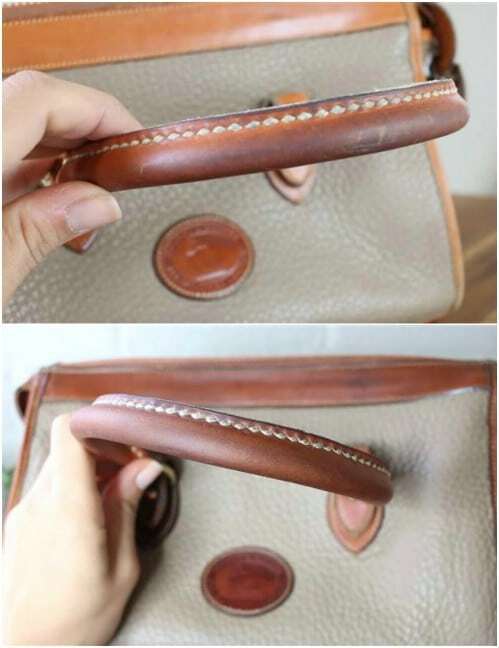 There’s a great little trick for removing stains and making that leather look new again, and it won’t harm the handbag in the process. Just clean it up with some grease fighting dish soap and then condition it with leather conditioner. 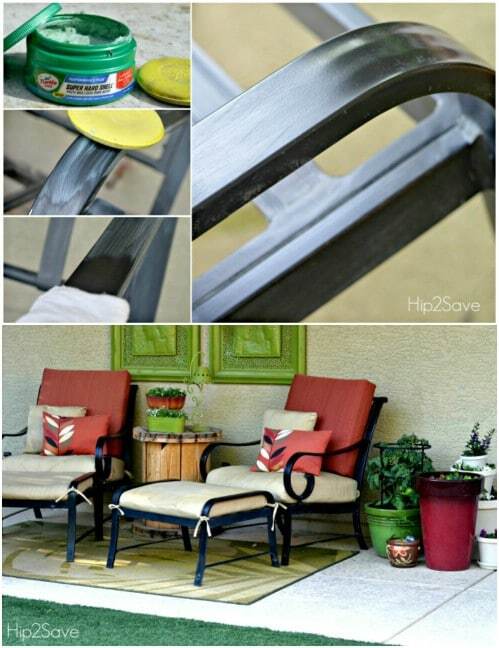 If your aluminum patio furniture looks a little worse for wear, there’s a great hack that will help you bring it back to its original beauty. Believe it or not, car wax works perfectly for this. Just grab some Turtle Wax – or whatever solid type wax you prefer – and go to town waxing and shining up that furniture. It will look good as new again and you won’t even have to paint it. If you have a set of fine china, chances are you only use it for special occasions, maybe even because it has stains or other discolorations. I’ve had the same set of china for years and clean it regularly to keep those stains away. I also found this neat little hack that will restore old dishes and make them beautiful once again. 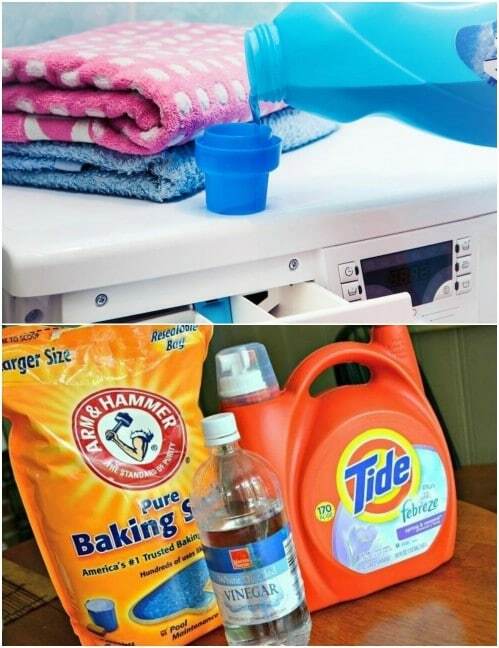 A couple of laundry products, like Oxy Clean and some peroxide are all you need to remove those stains and lines and give your old china new life. Bath towels tend to get worn down over time, so that they aren’t nearly as fluffy and comfortable. If you have noticed your towels are less than soft and fluffy, you can restore them with this simple trick. 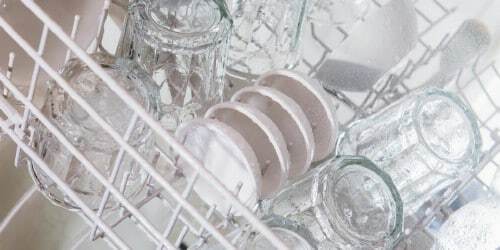 Just add a cup of white vinegar to the wash cycle when you’re washing your towels and half a cup of baking soda to the rinse cycle. The two work together to remove dirt and grime, as well as odors, and fluff that towel material back up to its original condition. The grout in your shower or your kitchen backsplash can get really dirty and after a few years of picking up dirt and grease, you may think the best way to restore it is to simply replace it. That’s not necessary true. Before you go off doing something drastic like pulling up your tile and replacing it, try this little cleaning hack. 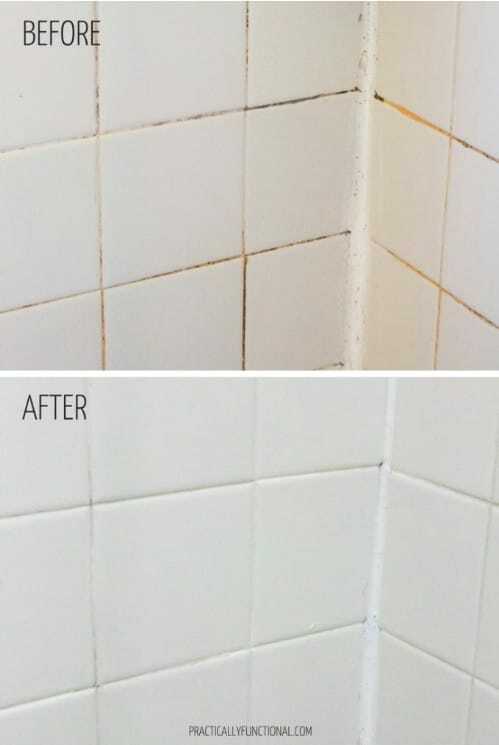 You only need a mixture of baking soda and bleach to remove that dirt and grime and your tiles and grout will look brand new again. 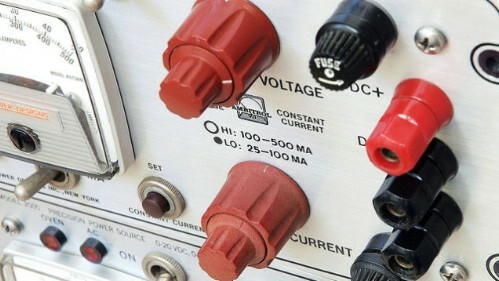 Your tools can really get greasy and rusty after time, and it’s very important to keep them in good condition. 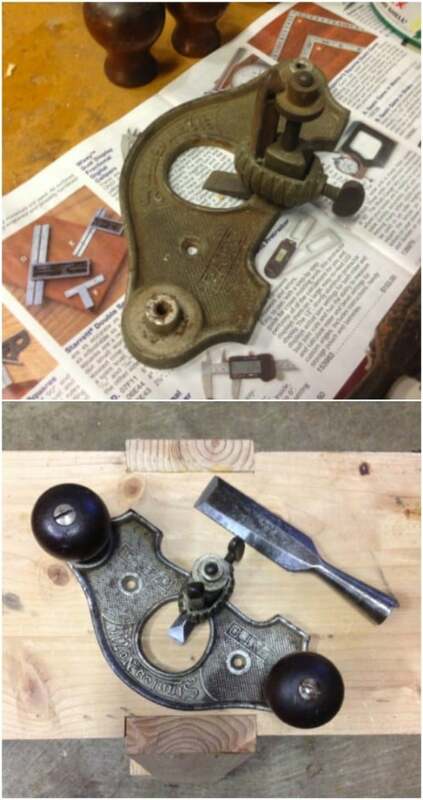 Instead of buying new tools because yours are simply too rusty to use any longer, you can soak them in Coca-Cola or vinegar to remove most of the rust. A little car wax also helps to clean them up and remove grease and grime, not to mention shine them to look like new again. 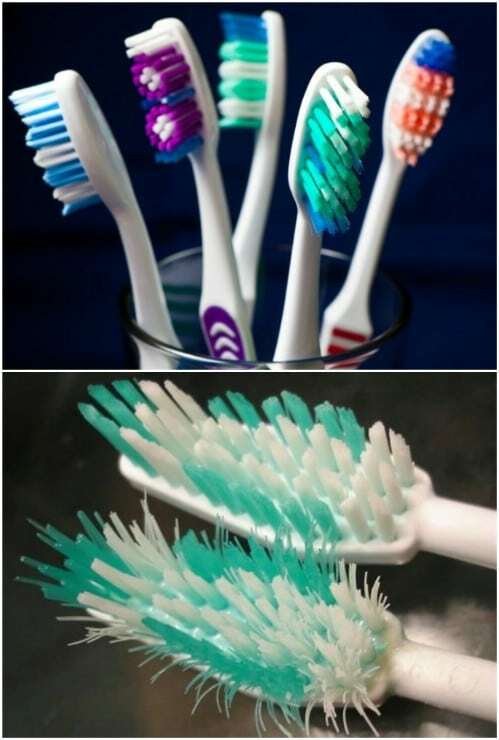 While I’m a firm advocate of replacing your toothbrush every so often, I do like this idea of restoring those old toothbrushes just in case you forget to buy new ones. Actually, by restoring your toothbrush to new again, you won’t even have to buy new ones that often. You can totally restore those bristles by simply soaking them in hot water. Just fill a bowl with hot water and swirl the toothbrush around. It will pick those broken down bristles back up and make your toothbrush look new again. So, you may clean your oven regularly to make it look like new, but do you clean the glass – or more specifically between the oven glass? Did you even know that you could do this? 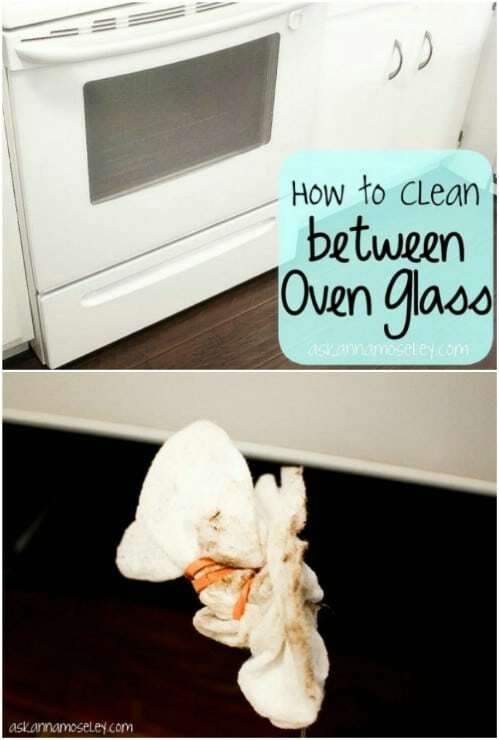 If your oven door glass is a bit cloudy and stained, you can simply take a wire hanger and a soft towel and clean it. Just insert the towel using the hanger through the holes at the top of the door. Swish the towel back and forth until all that cloudiness and dirt is gone. If you have a few antique jewelry pieces, you certainly don’t throw them out because they look old. You restore them! 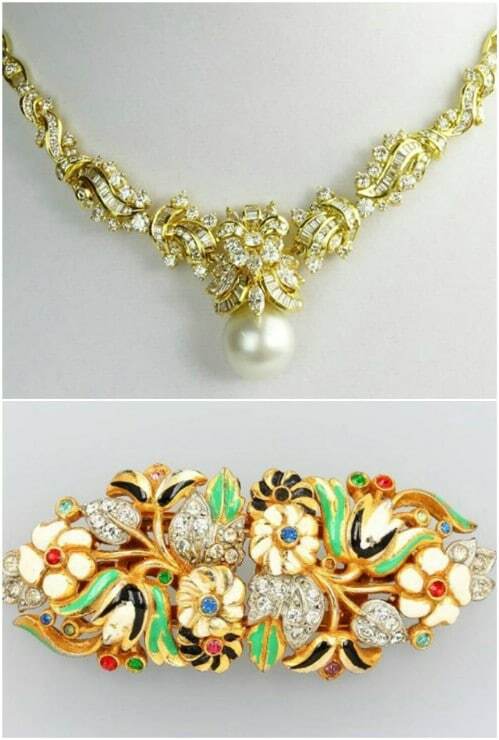 You can clean antique jewelry easily and safely and make it look nearly new again. Of course, you still want it to have that great antique look but you want to remove any tarnish that it may have. You can use a soft toothbrush and a bit of gentle dish soap to remove dirt and tarnish. If you have white sneakers, you know how difficult it is to keep them clean. You may think it’s just much easier to throw them out and buy new ones when they become stained and otherwise too dirty to wear. 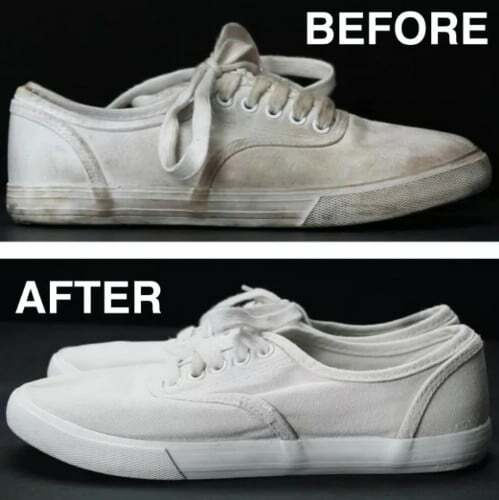 But, you can clean them up and make them look brand new again with a mixture of hydrogen peroxide and baking soda. You mix a paste and cover your shoes, then leave them in the sunlight to dry. Once dry, just clap them together to remove the paste and your stains go with it. If you have wooden coffee tables or other furniture that has scratches and it otherwise looking its age, you can clean and restore that furniture with natural products that won’t harm it and will help it to look new again. Just mix olive oil and water with white vinegar in a spray bottle. Spray that furniture down and rub it clean with a soft rag. 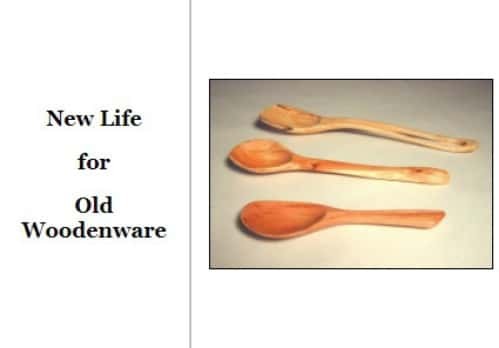 If you just can’t part with your old wooden spoons – and I wouldn’t blame you; I’ve had mine for years – you can clean and restore those spoons to look like new again. You’ll need to sand them down to help remove any stains and then add a coating of edible oil like vegetable, olive, or peanut oil. Rub in the oil and let them cure for a couple of days and they will look and function as good as new.